The power of innovation has become clear to me as we introduce new Visteon products and systems in Japan. It is particularly evident at our customer tech shows in Japan, where we acquaint individual automakers with our latest technology for new-generation vehicles. The most frequent questions we address at these events are: What specifically differentiates Visteon’s products from those of competitors, i.e., what makes our products innovative? And, how does Visteon deliver new technology products that meet customer requirements for quality, cost, delivery, development and management (QCDDM)? We spend considerable time with our Japanese OEM customers focusing on their particular interests. For example, Mazda, our largest Japanese customer and a longtime partner, values our connectivity master unit (CMU) for infotainment, as well as display technologies. Nissan and Mitsubishi are becoming more strategic customers with our instrument clusters, head-up displays (HUDs) and telematics. And we are working to expand our business relationship with Honda and Toyota around the world. The greatest interest from Japanese customers centers on instrument clusters. Visteon leads the market in digital clusters, and our capabilities and new developments in displays and domain controllers have further attracted attention in Japan. In fact, instrument clusters will be the biggest-selling Visteon products in Japan. We continue to invest in advancing these products and making them even more effective. At the same time, the Mazda CMU has been extremely popular, reflecting Visteon’s unique value proposition and QCDDM performance. We have consistently presented a bold and realistic vision of cockpit electronics at our Japan tech shows, building on the evolution of the digital cluster. We have also emphasized the critical role clusters and displays will play in autonomous vehicles – helping occupants understand what the vehicle is seeing and doing, and monitoring drivers to ensure their readiness to retake control of the vehicle in certain situations. Because Japanese automakers produce and sell more than 80 percent of their vehicles outside Japan, they are especially sensitive to having a strong hand in the future of autonomous vehicles, the technologies that enable them, and the industry standards that will apply to them. When considering our overall technology roadmap, Visteon must also remain aware of the features and requirements for the North America and China markets, where Japanese automakers historically have focused their product planning. Within a decade, Japan’s automotive sales to China will outnumber those to North America, so the voice of Chinese customers increasingly will help define new global requirements for Japanese automakers. Overall, opportunity in Japan abounds. Japan has modernized roads, bridges, tunnels and railroads, and mobility within the Japanese islands is generally easy and efficient. Many structures are funded by tolls and government subsidies – some urban areas require maintenance and rural or desert areas require upgrades. Visteon can play a large role in helping car owners deal with difficult roads and bridges by offering driver information products fully connected to infrastructure updates, along with autonomous vehicles that intelligently avoid heavily congested roads and risky surfaces. Connection to real-time road information will play a significant role in improving the driving experience in Japan in the future. Over the next two to three years at Visteon, I expect to see unique technology emerging around clusters, dimmable lenses, OLED, HUD and the SmartCore™ domain controller. We also anticipate a new infotainment product for the Mazda CMU. For Japan as a country, I hope to see Visteon’s DriveCore™ autonomous driving platform make a leap among Japanese OEMs over this same period. Fueled by the power of innovation, I am very optimistic that the best days of Visteon in Japan are ahead of us. Based in Yokohama, Yo Iikubo is vice president, Japan customer business group at Visteon Corporation. He is also the representative director and president at Visteon Japan Limited. 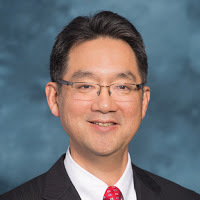 Prior to joining Visteon in April 2017, Yo spent 24 years at Lear Corporation, where in his last six years he served as director of sales and business development – Japanese OEMs North America. Yo has a BSE in materials science and engineering from Purdue University and a master of business administration from the University of Michigan – Stephen M. Ross School of Business. Many of the most popular technological developments in today’s global society have evolved from the inspiration of a single individual, company or breakthrough. Steve Jobs’ iPhone, Mark Zuckerberg’s Facebook, Jeff Bezos’ Amazon all have been seismic innovations that have changed the lives of billions. Advancement of automotive technology, however, rarely has resulted from the vision of just one person. Nearly universally, the vehicles of today and tomorrow represent a “quilt” of exceptional innovations from collaborators, such as those who most recently have come together to advance self-driving technology. Over the past century, the collaboration of suppliers and manufacturers has been responsible for most of the innovation in our cars and trucks. Today, automated driving is so complex and nuanced that no one entity can resolve all the challenges it represents and be good at creating every aspect of the self-driving vehicle, so collaboration remains essential. Collaboration and integration have become art forms in the automotive gallery, with a creative supply chain that has enabled the industry to keep up with consumer demand and preferences. Consumers want vehicles to keep pace with their lifestyles just as much as they want a tablet or an online marketplace to reflect their constantly changing needs and tastes. Automotive companies gain this timeliness through collaboration. One successful example of such collaboration—and one close to my heart—is the work being carried out by Visteon and STEER, the company that I founded. STEER has created the first level 4 fully autonomous parking technology, which transforms everyday cars into driverless vehicles that self-park in designated lots. This technology, activated by a mobile-phone app, lets drivers and passengers be dropped off at their destination; then the car takes over from the drop-off point, navigates and drives itself to a parking area where it detects an open available spot, and parks itself. When they’re ready to leave, they summon their car with the same app. It’s a complete solution that works with existing systems in vehicles and is cybersecure. Creating this technology, however, is very different from finding a way to integrate it into current and future vehicles and ensure that it works as intended, every time. For that task, we collaborated with Visteon. 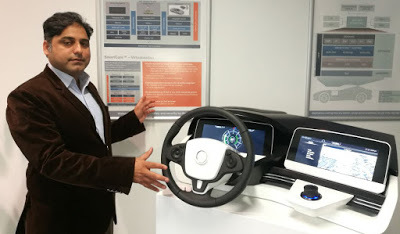 A few years ago, I met Visteon President and CEO Sachin Lawande, and I was immensely impressed with his vision and his extreme focus on efficient execution, especially in relation to Visteon’s DriveCore™ autonomous driving platform. Visteon had very clear goals and sought out the right team members to pursue them. We were on the same page regarding how to conquer the automated vehicle market. In 2016, Sachin and I came up with our formula for integrating STEER and DriveCore™, literally on a paper napkin. DriveCore™ was precisely the right technology for making STEER a practical automotive technology. Its high computational capabilities, robust systems and its ability to support more than 10 sensor channels with Ethernet connectivity are packaged in a very small unit. Moreover, DriveCore™ has enough power to integrate our valet parking system with autopilot technology. These two advancements could be developed independently and then be integrated seamlessly on DriveCore™. This results in a better value proposition for automakers – a bigger solution that is developed more rapidly. During development, STEER and Visteon together addressed countless edge cases that make automated driving an infinite microcosm of slight differences among driving situations and driver reactions. DriveCore™ has all the features we need to exhaustively prove all the scenarios we must consider now and in the future. My greatest surprise during this experience was how easy it was to collaborate with Visteon. It’s a large, global company, but one with no bureaucracy to get lost in. Visteon has promptly addressed every need as soon as we’ve identified it. Our ability to bring STEER to market so quickly speaks to the success of this collaboration. Before long, STEER-equipped vehicles using DriveCore™ technology will roll out in Asia, followed by the U.S. and Europe. What I have learned from this collaboration process is that, if you run a technology company, first you must focus on getting your niche problem right. Then you need to exceed expectations, and build and test the guts out of it. After that, envision the delivery vehicle for your product to go to market and approach the right partner. STEER has used this process to transform our expectations into a transformative, practical technology for automated valet parking. We envision more great developments, collaborating with great companies like Visteon. Our next collaborative innovation is just one napkin away. 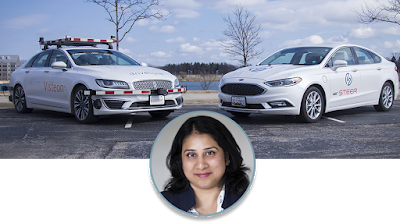 Anuja Sonalker, Ph.D. is the founder and CEO of STEER Tech, and has nearly two decades of experience in the automotive and cybersecurity industries. Headquartered in Columbia, Maryland, STEER builds products that enable autonomous features in mainstream vehicles, stimulate smart transportation and prevent automotive cyber threats. Dr. Sonalker oversees technology development, navigation of industry landscape and development of go-to-market strategies. Prior to STEER, Dr. Sonalker was vice president of engineering and operations for TowerSec, an automotive cybersecurity company that was acquired by Harman International in 2016. She was also a project manager within the automotive security group in the cyber innovation unit at Battelle, where she led advanced research in vehicular environments and transition to market strategies. Dr. Sonalker is currently the vice chair of the SAE Vehicle Cybersecurity Systems Engineering Committee and co-chair of on the ISO International Standard on Cybersecurity Engineering for Road Vehicles. She holds a Ph.D. in electrical engineering from the University of Maryland College Park, a master of science in computer engineering from North Carolina State University and a bachelor of engineering from the University of Mumbai. Beginning this summer, vehicle cockpits around the world will become a lot more interesting. That’s when the first production vehicles from a German automaker will roll off the lot equipped with Visteon’s SmartCore™ technology. In conventional automotive cockpits, technologies such as the instrument cluster, center stack, infotainment and telematics each are driven by a separate electronic control unit (ECU). SmartCore™ combines the functions of multiple ECUs into a single box, or domain controller, which ultimately may serve as the brains for every display function across the instrument panel and into passenger areas. The SmartCore™ offerings will integrate the instrument cluster, a head-up display (HUD) and Visteon’s infotainment platform into a single domain controller. Visteon engineers already are working on integrating lighting, heating and air conditioning displays into near-future versions. By the early 2020s, SmartCore™ could be controlling telematics, advanced driver assistance system displays, augmented reality head-up displays, vehicle mirrors, surround-view cameras, driver monitoring and rear-seat entertainment — all from a single box. Integrating control of these functions on a single ECU reduces signal latency, eliminates excessive wiring and saves considerable weight. The hardware can be used more efficiently, eliminating the need to duplicate interfaces for memory, display and video in separate ECU boxes. With new approaches from chip designers, SmartCore™ can generate more computing power to drive an expanded number of functions. Visteon has incorporated exceptional security within SmartCore™. Downloaded data needs to be signed and authorized by the car dealer. Hardware security walls are built to prevent suspicious applications from intruding into the secure portion of SmartCore™. SmartCore™ will play an important role in the transition to self-driving vehicles. When future cars are in fully autonomous mode, drivers will be able to take their hands and eyes off the road, shifting their focus to screens along the dash. They can view text, images and video there and interact with the screens, with all this functionality driven seamlessly by a SmartCore™ domain controller. SmartCore™ also will integrate input from cameras and other devices monitoring the environment outside the vehicle, so drivers and passengers can receive information about their surroundings. In the future, augmented reality will be incorporated into the SmartCore™-driven displays, presenting avatars of people, objects and virtual creations outside the car to the occupants inside. Imagine how all this integration could change your GPS display in an autonomous vehicle, adding detailed information about your destination, images of nearby attractions, audio and video. Your music player expands from showing an entertainer’s album-cover art to presenting a full-motion music video. Eventually, video conferencing could be integrated into SmartCore™, and passengers could play SmartCore-controlled games. Additionally, SmartCore™ could make cars and trucks even more secure by enabling vehicle tracking, remote immobilization, remote assistance and security for shared vehicles. With the first SmartCore™-equipped vehicles about to hit the road, we’re embarking on an exciting new chapter in vehicle cockpit efficiency and integration. Watch this space closely – the story will continue to unfold as we approach the autonomous driving era. Waheed Ahmed oversees software architecture development of future domain controllers at Visteon. He is focused on next-generation automotive cockpits and their role in autonomous cars. Ahmed has proven leadership and R&D experience in software systems, spanning more than 15 years. Prior to joining Visteon, he worked in the semiconductor industry as an engineer, architect, and scientist. Ahmed earned his master’s degree in computer science from RWTH Aachen University in Germany. He has published six international peer-reviewed scientific papers, filed six U.S. patent applications and authored a white paper on the fundamentals of domain controllers.